The Battle of Sutjeska was one of the most difficult and bloodiest battles of the World War II in Yugoslavia, in which Partisan forces engaged against joint German-Italian and quisling troops. The battle, also know as the Fifth Offensive or Operation "Schwarz" took place between 15 May and 15 June 1943 in the region of Montenegro, eastern Herzegovina and eastern Bosnia. The final and bloodiest struggles happened in the area of the Sutjeska River and the surrounding mountains. During the months of struggle over 7,500 of Partisan fighters of the Main Operational Group of Yugoslavian National-Liberation Army were killed including a large number of the wounded from the Central Hospital that travelled along the Partisan group. In memory of this great battle a memorial complex was built with a monument, authored by sculptor Miodrag Živković as its central part and the Sutjeska Battle Memorial House, an architectural master-piece of at the time very young Belgrade architect Ranko Radović. 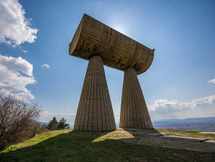 In the mid-1960s, a monument for fallen soldiers of the Battle of Sutjeska was designed by sculptor Miodrag Živković. In the Valley of Heroes, Živković set up a magnificent monument on the top of a hill. The monument enriched the space of the already famous ossuary, built in 1958 by architect Sakeb Hadžihalilović, with the remaining bodies of 3301 Partisan soldier who died in the Schwarz operation. After two years of construction, Živković's monument was ceremoniously opened in 1972. 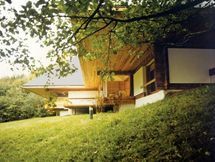 At the same time, the Memorial House by architect Radović was built. With the list of names of all victims, it was adorned with narrative frescoes by Croatian painter Krsto Hegedušić. Wings of victory are placed on the top of the hill so that the entire valley of the Sutjeska River can be seen. The valley, bearing blood and suffering of less than a century old battle, is now protected by a magnificent white monument. On the one hand, all of the monument's representativity is attained by the environment and nature itself, but on the other hand, any man walking by it will be left curious. A mystery is created at the very beginning of the journey towards the monument. It slowly builds up and is further enriched when arriving to the top. Anyone who approaches the monument from the valley, will at first see only white tips of wings protruding through the top of the hill. The paths extend to the bottom of the valley as strings on a guitar, and do not reveal anything that is hidden in the magical mountain. In the sound of silence, only silent grunting, reminiscent of the steps of the mighty troops of soldiers, can be heard. Lifting is steep and divergent. Flora and fauna lead you upwards towards the top, and the view around you confronts you with a wonderful and dramatic image of the valley. Wildlife, shadows and surrounding creeks, or the forest that sweep through the valley, are all remainders of terror, the wickedness and the cruelty of death, which had flooded the gorge. Only at the very top is a glimpse of all the majesty of the monument. First, there is a bumpy ossuary, the grave of all those who have lost their lives, and on the pedestal, their souls are merged into two white 19 meters high rocks, which symbolize the breakthrough through the enemy forces. Like a gorge with a sloping hill, they almost collapse into one and form symmetrical wings on the body of victory. The monument rises high in the viewer's perspective peaks in the background can be seen, which frame the dark path leading to the battle line of the Partisans. The contact of the wing is also the contact of the faces modeled on the monument's inner surface, the power of one side and the devil of the other. Fighting, despite thousands of victims, turns to victory. From afar, we recognize a shape of a flame in the monument. A flame, which from near brings life to life and acquires human energy. From the ossuary, to the monument, to the base, two white clusters are directing and absorbing the subject to the breakthrough of partisan units. This is further symbolized in the dramatic rhythm spaced structure of the monument itself, and even more in broken structure on its surface. Under the monument, the subject is placed among the figures and the faces of the fighters, and thus gets the feeling that the fighter himself is standing in the columns of partisans who are breaking into a breakthrough. Although the monument is a clear emblem of victory, while walking around it, hundreds of other mysteries and diverse images of the monument are exposed. The created forest boundary frames sculptural work and leads you to observe the artistic object also from the edge of the landscape. At this point, the monument is no longer as high, but appears as a cliff in the landscape, it rises towards the top, spreading its wings and opening the palms towards the sky. It shows you a new way to the dark woods and the invisible path to the sky, where all the wounded and lost souls of warriors have flown. The shadow of the monument in the trail brings us to an even smaller area - an amphitheater with eight benches each side. The space of tranquility and peace, an opportunity for rest, and for reflection. The entire monument creates a landscape narrative of the dark battle, which despite the huge number of fallen combatants, ended with the Axis failure, and was decisive for the final victory of the Partisan forces in WWII. With the victory for the freedom of all those who were trapped in their homeland. In the way, as the art critic Giulio Carlo Argan said: "... the monument, before being a form, is a site." True, the monumental space is not only the area of the monument, but the scene of battle, escape, and death. Despite time slowly erasing the feeling of horror, memory of the events remains. With the sculpture of wings, Živković at first glance only emphasizes triumph, but with a more detailed insight into them, we see the brave faces of the warriors, wounded bodies; and captured views, hidden on the faces of white concrete. The masterpiece of the mighty wings is a sculptural creature that carries the interweaving of historical events with a strong aesthetic, and of course, an artistic note at the place of one of the most dramatic battles of the Second World War. You are particularly aware of this fact when you watch the monument "face to face".